1.West Country Farmhouse Cheddar PDO – this last won in 2000 but still earns its place on the board. I would opt for an 18-month-old Quickes, Denhay or Montgomery. All are full of rich creamy summer milk, firm bodied and bursting with long complex flavours. If your table is populated with under 35’s, the two-year-old 1833 from Barbers will please. 2. Old Dutch Master – won in 1999, when it was a Dutch unknown called Kolluma. At 18 months maturation, its warm, fudgy notes please everyone around the table. 3. Le Gruyere AOC – the only cheese to have taken the title on three occasions (1992, 2002 and 2005) and has been in the top 15 every year for a decade. It must be a 16-month matured Premier cru or Cave Aged for a long, nutty finish. 4. Ossau Iraty PDO – the 10 month matured unpasteurised sheeps’ cheese from the Pyrenees that grabbed the title in 2006 was a stunningly complex Ossau from Fromagerie Agour. A star performer, it took Super Gold again this year. 5. Camembert Super Medaillon – this superbly balanced, creamy camembert from Isigny took the Championship in 2001 and is a real crowd pleasing alternative to the PDO Camembert de Normandie. 6. Brie de Meaux PDO – won in 2007 and confirmed itself as one of the world greats. Brimming with rich, earthy, grassy notes, it has earned its a place on any board. 7. Shropshire Blue – no one had heard of this orange blue from Stilton country until the Cropwell Bishop version took top honours in 1995. A lusty alternative to Stilton – or even an addition. 8. 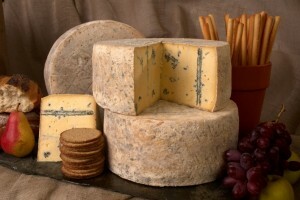 Cornish Blue – the 2010 World Champion, our first for a decade and a real star. Created originally for the ladies by an ex-rugby player, is offers egalitarian qualities for all cheese lovers.